The Peninsula Hotel Chicago towers over the north side of the Magnificent Mile offering incredible views of the Chicago Harbor. Owned by Hong Kong based Peninsula Hotels Group, the hotel offers premium luxury accommodations with hospitality based on a blend of both Asian and Midwest graciousness. Over the years the hotel has gained international attention by winning several prestigious hospitality awards including one for world’s best hotel bar. One of just three five-star hotels in the state of Illinois, the Peninsula welcomes guests from around the world, from corporate business leaders to celebrities to important political figures. Visiting the Peninsula, guests will enjoy exemplary service. Hotel standards are sky-high, providing information, arrangements, and dining for whatever the occasion. Three room types and a whopping six suite styles are available, with the Peninsula Suite offering some incredible details and amenities throughout. Incredible shopping experiences at the nearby Magnificent Mile, glorious architecture throughout waterfront streets and the inner city, and a vast array of cultural events attract thousands of guests to the hotel, and millions to the city. 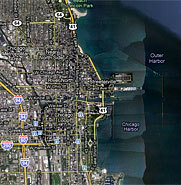 The location is sublime, offering numerous ways to explore Chicago’s finest points. The Chicago River is just blocks away, beautiful Lake Shore Park is within easy walking distance by the waterfront, and Northwestern University is just minutes to the east. The Peninsula Chicago Spa is an unparalleled urban retreat in the Windy City. Blissful stays melt into dream-like states as the mind, body, and soul are rejuvenated. Aesthetically, the spa is stunning and just a mere look will lighten the shoulders of any weary or burdened traveler. Personalized service includes full and half day treatments for skin, muscles, and overall wellness. From oshadi and marine mud body wraps to detoxifying pedicures and other fine finishes, the Peninsula Hotel Chicago Spa offers a completely nourishing experience.